Simplilearn provides certification training for working professionals to help them achieve career goals. With over 40 certifications, 400 courses, 2,000 qualified trainers and half a million professionals trained, Simplilearn is one of the leading education portals alongside Lynda (acquired by LinkedIn), Khan Academy and Udemy. In this Simplilearn review, you will see how the platform can be a fit for small business owners and start-ups who want to learn about Agile, Scrum or Digital Marketing as well as professionals in larger organizations looking to master DevOps, Salesforce, and Quality Management. Where Simplilearn shines is its live, instructor-led training sessions and certificates that have been approved accreditation bodies. For value seekers, the price is fair for the wealth of information provided, particularly if you choose an Online Classroom Season Pass that provides an all-access pass to over 25 courses for 90 days. But what else do you need to know about Simplilearn before signing up for its online training programs? Is Simplilearn Right For You? What Courses Does Simplilearn Offer? When Are Simplilearn Live Courses Held? Compared to Udemy, which has tens of thousands of courses or even Lynda which has thousands of online training courses, Simplilearn has comparatively few with around 400+ courses. But don’t let the lower number be a deterrent. 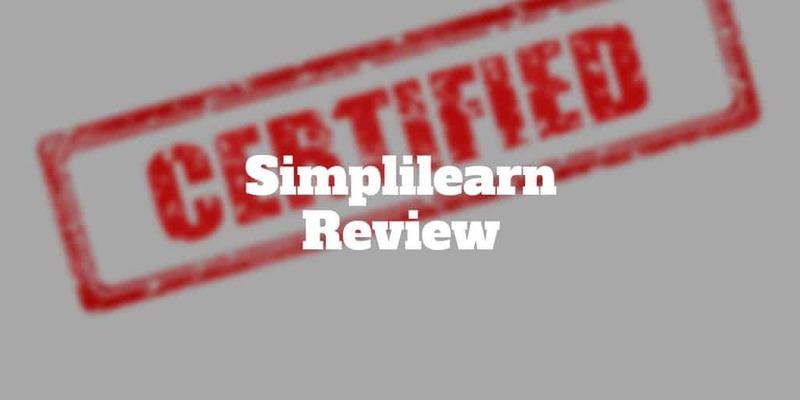 What Simplilearn lacks in quantity, it makes up for in quality. Many courses are recognized by accreditation bodies. Plus, Simplilearn offers an Online Classroom Season Pass that distinguishes it from other online training portals by providing 90 day access to live instructor-led training sessions that are accompanied by a 7-day money back guarantee. Simplilearn courses are held in batches, which feature around eight to ten live instructor-led sessions. They are available at convenient times during business hours as well as mornings and evenings. It is simple to sign up to a batch at a certain time and then subsequently modify the time depending on your own schedule preferences. When you sign up to the Online Classroom Season Pass, you can access as many batches as you wish. Live instructor-led sessions are generally held in WebEx and often begin with trainers helping to answer participants’ technical or troubleshooting questions followed by an instructor-led tutorial. You can ask questions during the session. Or if you cannot attend live, you can view a session recording afterwards. Let’s say you want to take a course on Big Data and Data Science. The course may include a couple of hundred hours of online tutorials that you can access for up to two years. But how do you practice what you are learning? The answer is Cloud-Labs which allows you to practice real life projects on Hadoop, R, and Python. You can view multiple labs at one time so you can view your syllabus and Web Console or other services simultaneously. CloudLabs may not seem like a huge value-add but compared to the methods used by some eLearning companies which require you to install learning software called Virtual Machines, the time savings are significant. From our research, Simplilearn training sessions vary in price from hundreds to thousands of dollars. When you compare the costs of training at Simplilearn to those at Udemy or Lynda, the prices are more often than not higher at Simplilearn. For example, the SEO Specialist training at Udemy costs $199.99 compared to $1,199 at Simplilearn. But a strict pricing comparison doesn’t provide the full picture. When you look a little further, you discover that the Udemy course is a single hour of training via on-demand video compared to 35+ live instructor-led courses offered by Simplilearn. So, while you often pay more at Simplilearn, you frequently receive more in-depth training and value. In light of the higher training costs, make certain you plan to complete the course before signing up. Not least because the Simplilearn refund policy isn’t particularly generous. For self-paced learnings, you can receive a full refund within 7 days only if you have not accessed more than 25% of the content or downloaded the e-book, in which cases the refund policy is void. Similarly for instructor-led training, you may be eligible for a refund within 7 days of the commencement of the first batch but the policy is void if you access more than 25% of the content of an e-learning course or attended Online Classrooms/received recordings for more than one day. Any refund requests for instructor-led trainings are also void if you downloaded an e-book. Between days 7 → 30, you are eligible for a refund of up to 75% of the fees you paid but thereafter no refunds are issued. What Simplilearn lacks in the breadth of its offerings, it makes up for in the depth of training provided on its Learning Management System (LMS). If you want specialist training, Simplilearn won’t disappoint. It earns high satisfaction ratings on average among customers and has been awarded an A+ rating by the Better Business Bureau. However, if you are looking for Simplilearn alternatives to compare pricing, Lynda, Udemy, and Khan Academy all have their selling points. Lynda and Udemy have a wider selection of trainings but frequently feature less depth. And so while they are frequently priced lower, Simplilearn may be a better bet in terms of value for money. For example, you can see a programming foundations course on Lynda and a web development foundations full stack vs front-end course lasts no more than a few hours while Simplilearn equivalents often feature a good deal more content. Khan Academy is another Simplilearn alternative worth exploring and is a 501(c)3 company that has a mission to educate the world. ✅ Recognized Accreditations: Many certifications offered by Simplilearn are recognized by accreditation bodies. ❌ Refund Policy: The refund policy is not generous, so be certain you plan to complete the course before signing up. ✅ In-Depth Training: Compared to e-learning rival platforms, Simplilearn has some of the most in-depth training. ❌ Training Fees: The out-the-door price of the trainings can be high for individuals, though corporations paying for employees will find the cost in line with industry norms. ✅ Flexible Attendance Options: Training sessions are available mornings, afternoons, and evenings to cater to virtually every schedule plus recordings are provided if you miss a live event. ❌ CloudLabs Setup: CloudLabs is designed to help customers avoid the clunkiness of downloading additional software but it’s a bit cumbersome to access. ✅ Live Training Sessions: In addition to self-paced training, you can attend live instructor-led trainings. ✅ Online Practice Environment: CloudLabs is an area where you can practice what you learn without needing any additional software or virtual machines. ✅ Customer Support: Around the clock customer support is available 24/7. ✅ Wide Variety of Professional Courses: From Big Data to AI & Machine Learnings, Simplilearn features an extensive range of online trainings sessions. ✅ Value For Money: While Simplilearn isn’t always the cheapest option, it frequently provides more value for money with great depth of training sessions. ✅ Online Classroom Season Pass: As part of the Season Pass, you receive 90 days of access to a wide variety of trainings for one fixed price. Simplilearn provides an excellent online learning platform for professionals seeking self-paced or live instructor-led training designed to complete certifications. Plus, many of the certifications are recognized by accredited bodies. You can choose from a wide variety of courses, including Big Data, AI & Machine Learning, Digital Marketing, Cloud Computing, Cyber Security, Software Development and DevOps. Although Simplilearn is not generally the cheapest online training option, it is frequently the best when it comes to value for money due to the depth of its content. Live classes are held throughout the day to cater to virtually any schedule and training session recordings are available on-demand. The bottom line is if you are looking for specialist professional training, Simplilearn’s learning management system may well provide the certifications you need to advance in your career. ‹ What Is Equity Research?